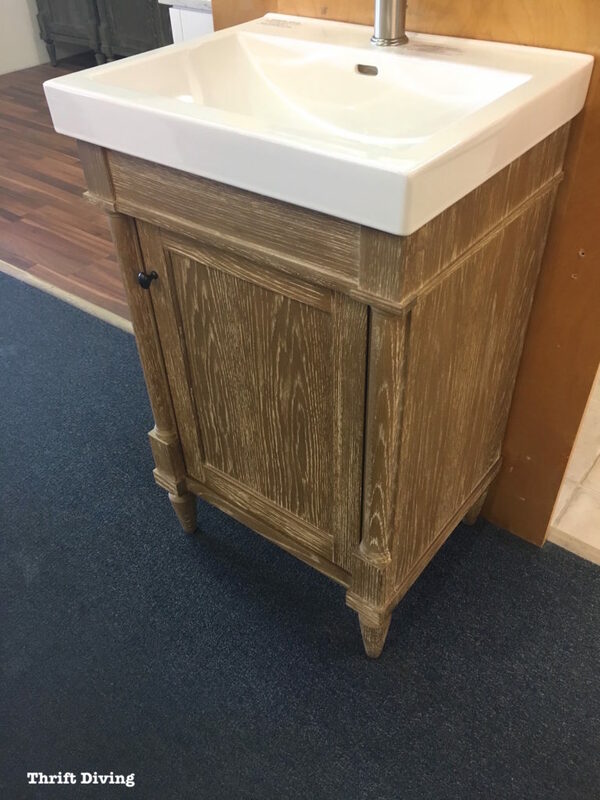 When I started my master bathroom makeover, I decided that I was going to build my own DIY bathroom vanity from scratch. I hadn’t ever done it before. But after removing my old vanity, I saw just how easy it was. A bathroom vanity, for the most part, is nothing more than a shell upon which a sink sits. When you think of it in terms of that, well, how difficult could it be?? I’m down to only 3 days left of my Room Makeover Challenge that my readers and I are doing together. I still have much more to do, as it’s Day 37, but right now, building a DIY bathroom vanity has become my #1 priority. And I don’t even have any stone to put on top yet! YIKES! 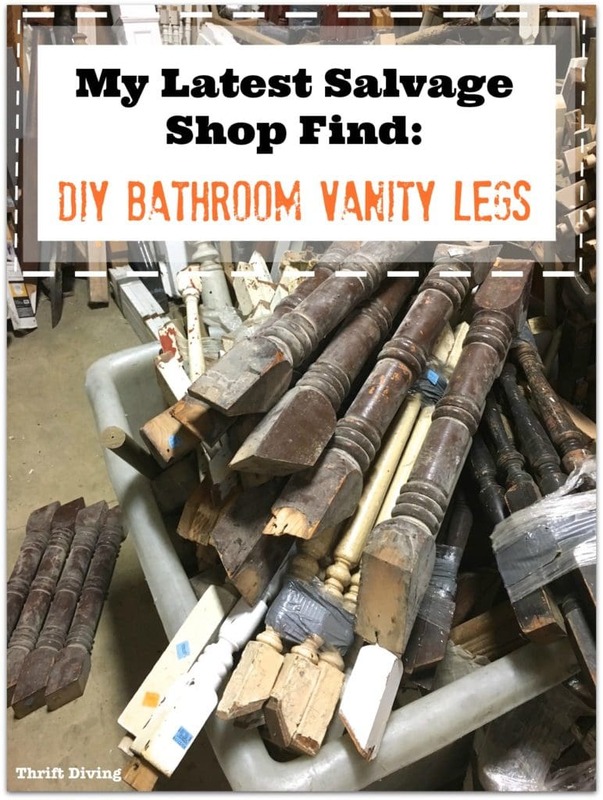 I Found DIY Bathroom Vanity Legs! 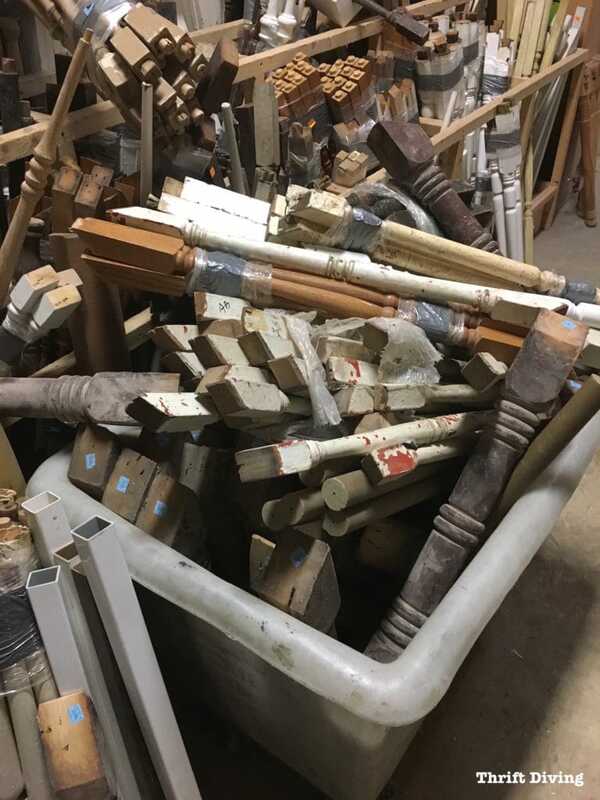 We’ve got an awesome salvage shop here in Maryland called Community Forklift. 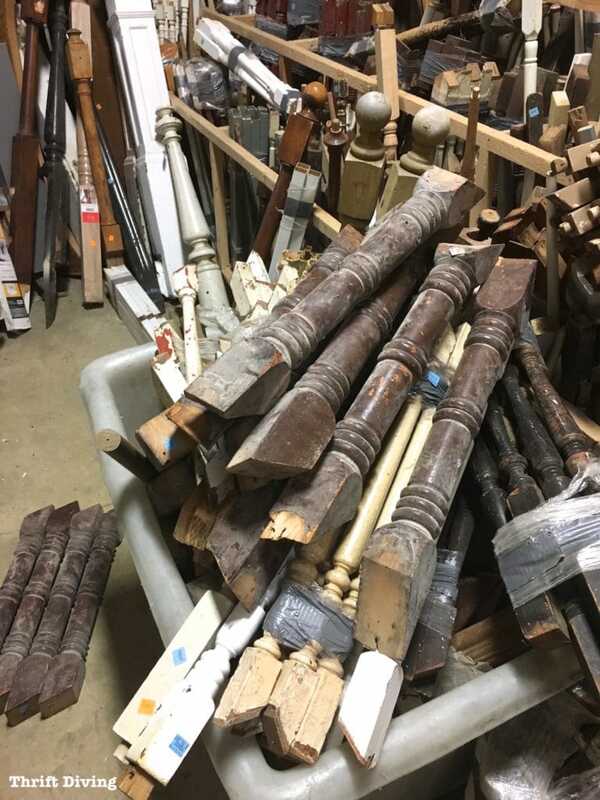 Think of it as a junkyard for your home. They’re a tad expensive on certain things, but within all that junk, there are definitely some affordable gems. Which is exactly what I found last month. One of my favorite sections has lots of legs and spindles. They’ve got tons of the stuff over there. But wait–what do I see….??!! I saw the perfect legs for my vanity! I went through and gathered up all the “good” ones that had enough of a block at the top and bottom in order to attach supports to them! The only catch is that each leg was–gulp–$13 each. I really didn’t want to spend over $50 on legs. But I liked them enough to at least lug them up to the front check-out to see if there were any sales that day. After all, it was just days away from Thanksgiving. That time of year, stores are teaming with sales! Imagine how my mouth dropped when I got to the front and was told that all legs in that section were 50% off! So instead of just getting four, I went ahead and bought eight. If I’m going to spend $50, I may as well get eight, right? The extra solid oak legs could be very useful. I laid down an old blanket in my van because they were unbelievably dusty and dirty. Before I show you what I’m doing with the vanity legs, let me back up to earlier in that day. Before I stopped at the salvage shop, I went to a bathroom remodeling showroom. 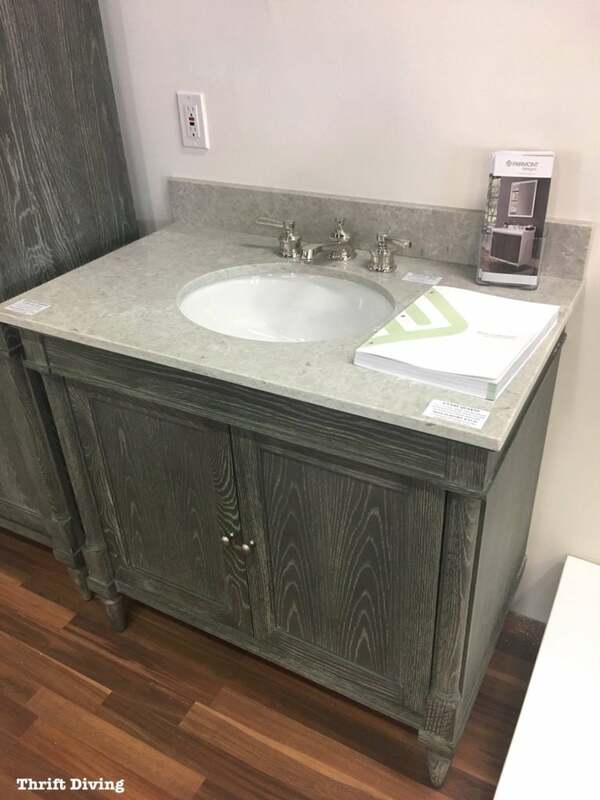 I wanted to get some ideas for what kind of vanity I even liked. The truth is that I don’t spend a lot of time ogling over design the way some home/DIY bloggers do. My design interest is simple: Is it clean? Is it functional? Does it make me smile? I loved the weathered oak vanities where I could see the grain of the wood highlighted. 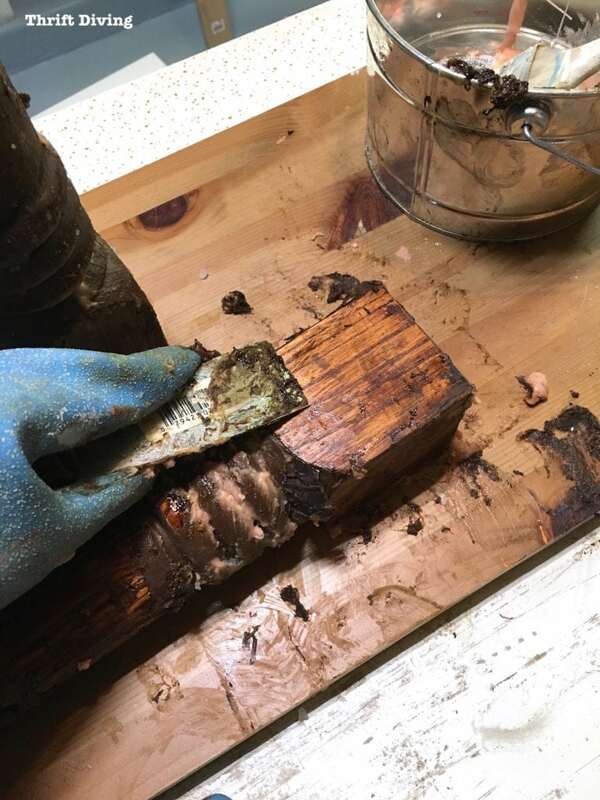 It reminded me of a painting technique that I learned last year when I attended an Amy Howard painting workshop, where you add a light coat of watered-down paint followed by liming wax to highlight the grain of wood. I’m typically not a “wood grain” kind of chick, but there’s something special about oak and the way its grain creates a nice textured look. I also loved this style, which was up off the floor about 10 inches, leaving a pretty little decorative leg exposed at the bottom. And I knew that I wanted my vanity to have something decorative at the bottom. 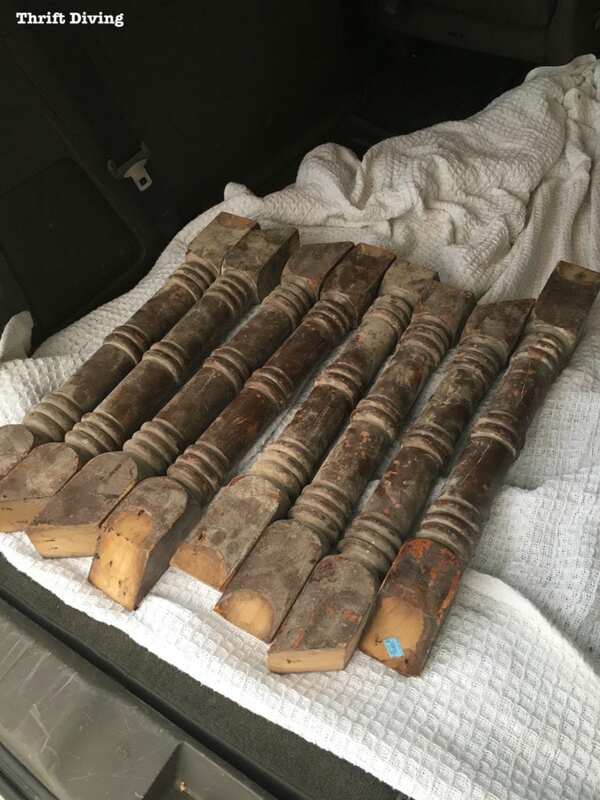 That’s when I headed to the salvage shop and found those beautiful oak scraps that would make perfect legs! If you remember, the legs were super dirty, plus covered with paint. 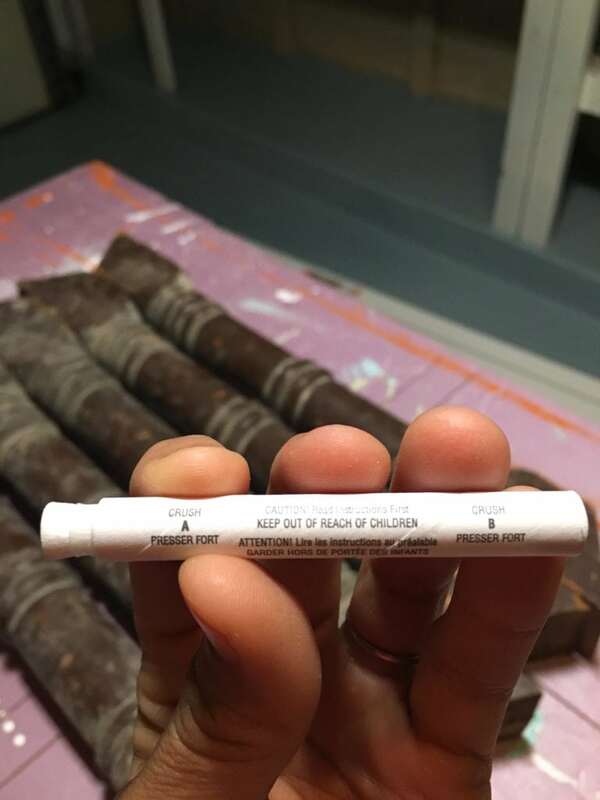 I had no idea how old they were and if the paint was lead-free. 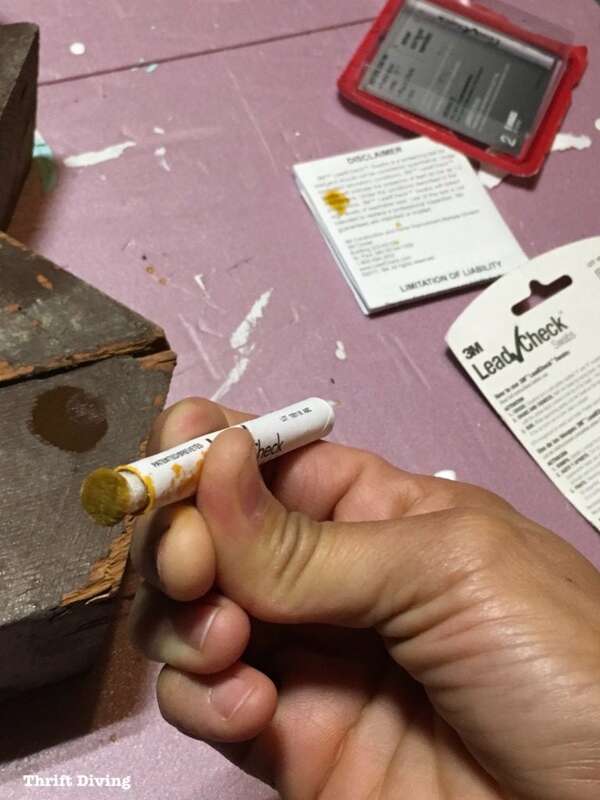 So the first thing I did was use a Lead Check test (you can buy them from Home Depot or on Amazon for about $10). 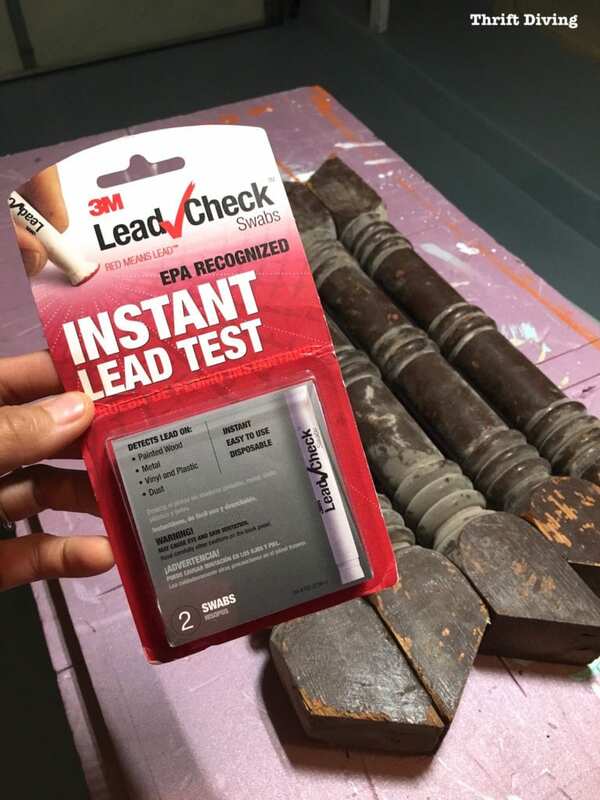 Whenever you’re working with furniture or things that have old paint, be sure to test them for lead before sanding or stripping. 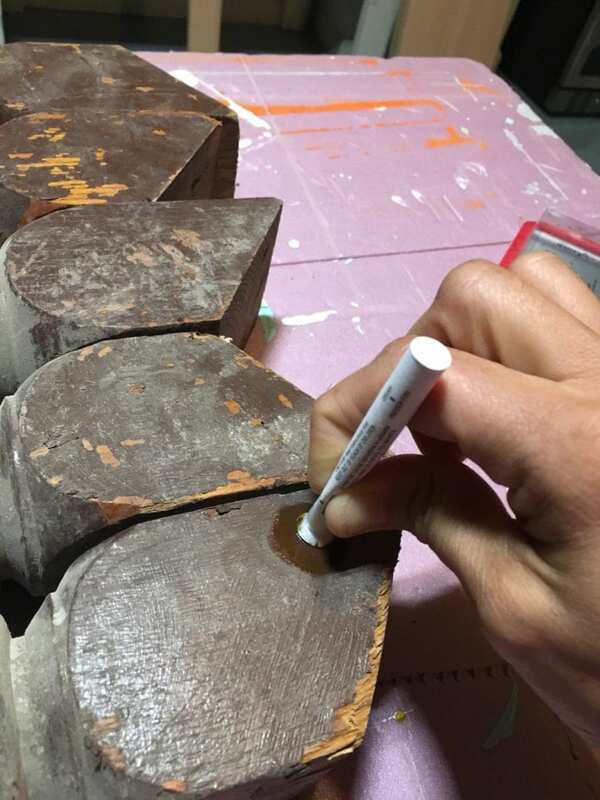 All you do is squeeze and crush the A part and do the same for the B part, then rub the tip on the paint you’re testing. It starts to release some fluid while you’re testing. If it’s red, it means there is lead! 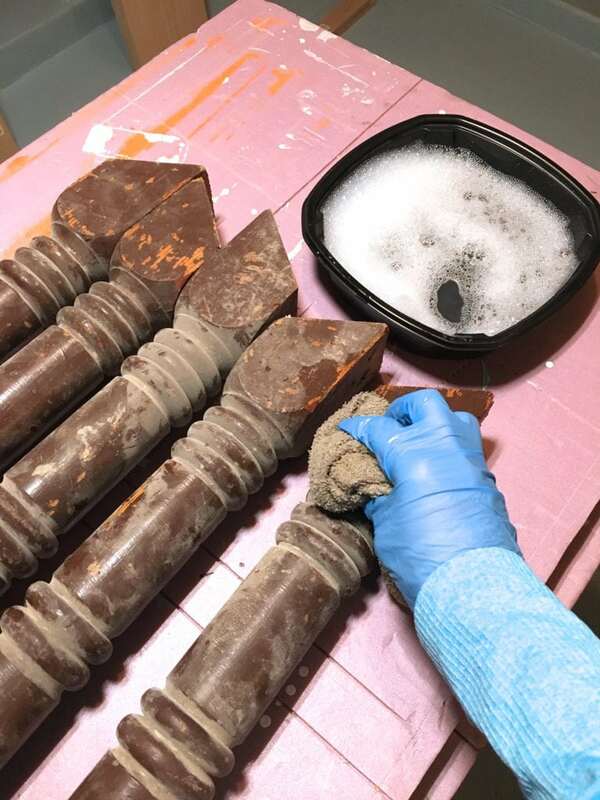 If it’s red, you should not sand, cut, strip, or disturb that paint. In my case, we’re safe! Next, I had to give them a bath with some hot, soapy water. Once they were all clean, I was ready to slice and dice with my little miter saw. I cut the tops to be straight, as well as shortened them. Not as fancy and decorative as some of the other legs from the showroom, but definitely still cute and sturdy! And for only $6.50 each! I placed them in the bathroom to check the height. 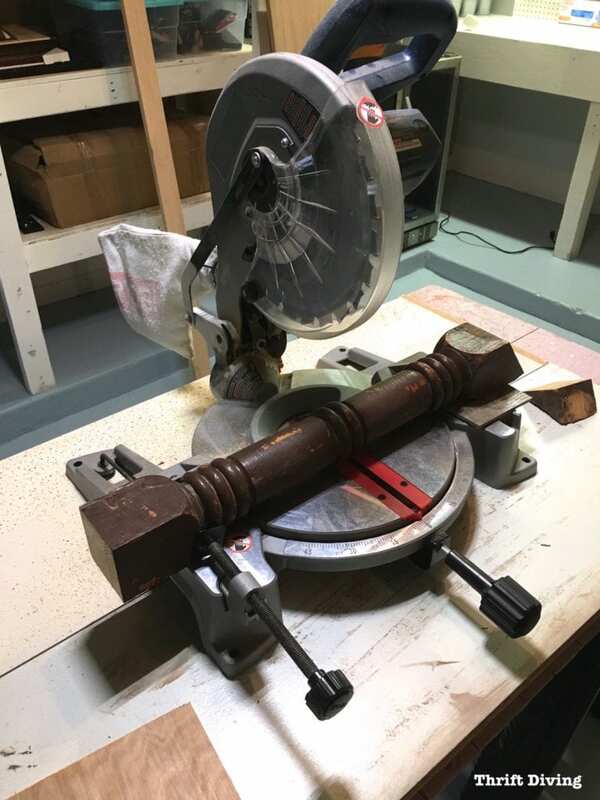 I have to make sure there is enough clearance for the pipes, so the legs were perfect around 11.5″ in height! Next, I slathered on some stripper to strip the legs (I prefer to use Citristrip stripping gel). I wasn’t looking forward to this part because it’s a messy job. And have you ever tried to strip legs and wood with nooks and crannies? The satisfying part is when you see the old paint starting to come off, exposing the lovely oak underneath! 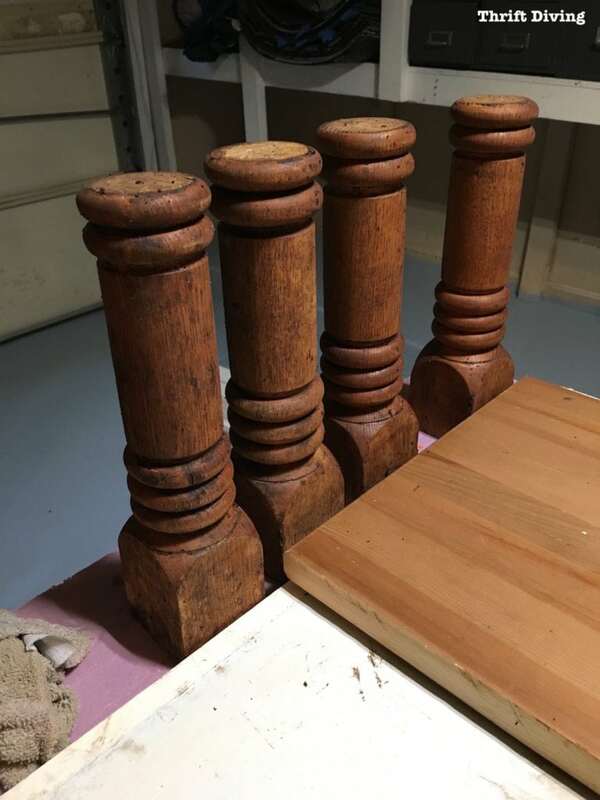 As of yesterday, this is where I left off: with (mostly) clean oak legs that will be ready for their second cleaning-off today. They’re still a bit gunky. 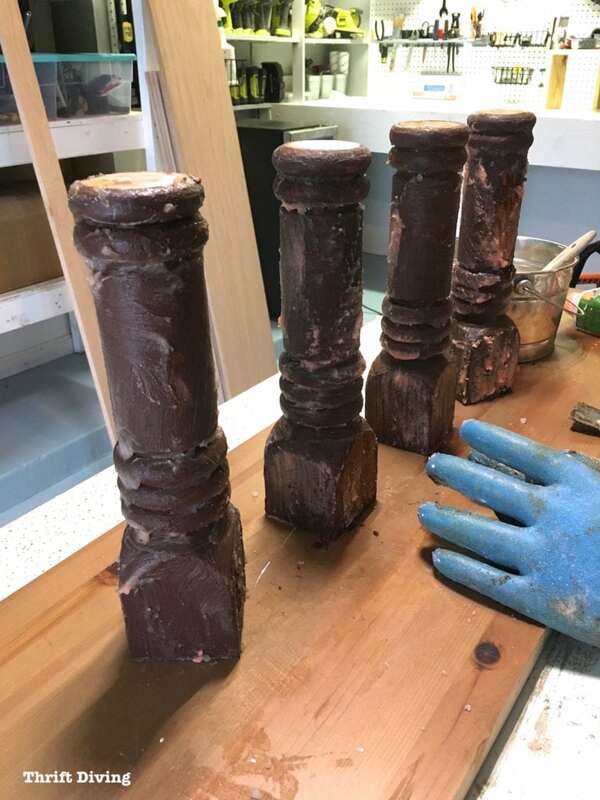 They need sanding down a bit, too. Sooooo……you’ll have to wait to see how this DIY bathroom vanity saga continues! Seriously, cross your fingers for me! Catch up on this master bathroom makeover series! 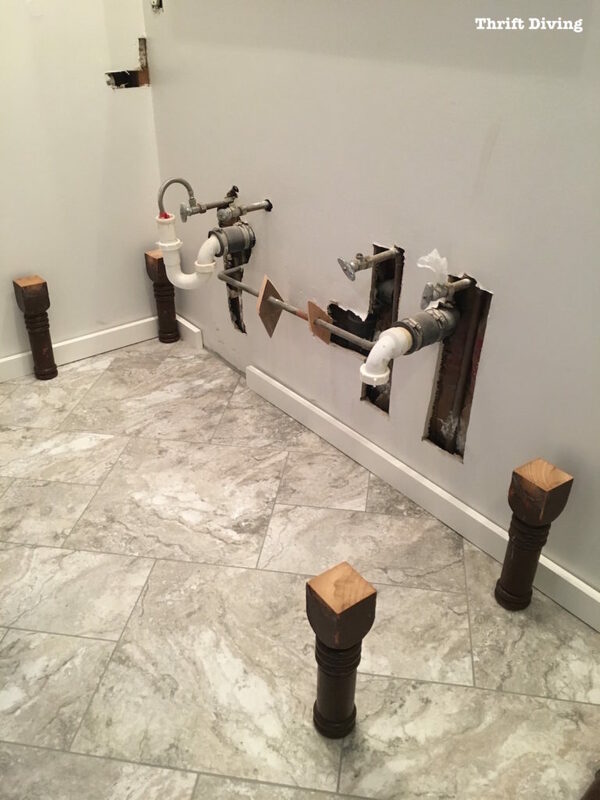 « DAY 28: Installing New Flooring in Our Master Bathroom! Love those spindle legs. You are fabulous to go threw all that work of cleaning and restaining. I no doubt would have done it too several years ago. Good luck finishing up. I can’t believe I actually stripped through legs, Betty! 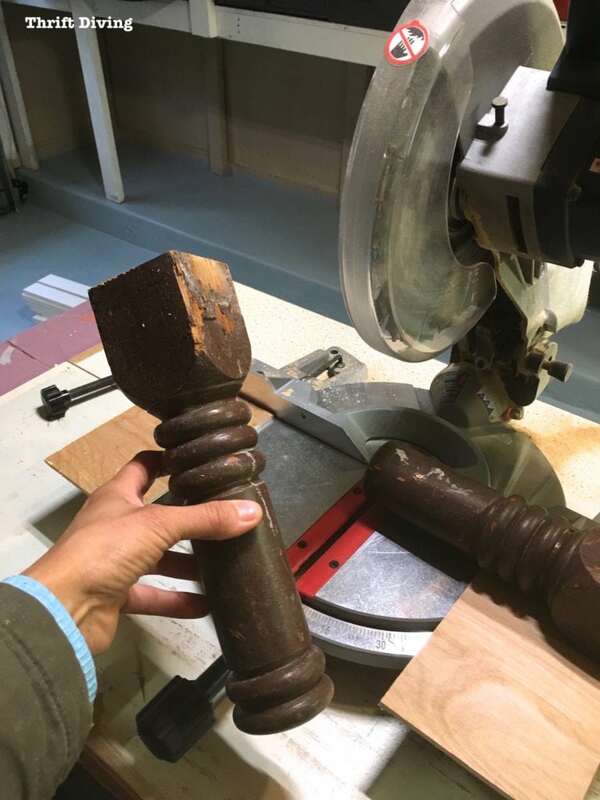 🙂 After doing a pair of chair legs last week and having that go horribly wrong, I had sworn off stripping anything with curves and grooves. LOL. But these legs were too perfect not to go through all the trouble! 🙂 Thanks, and I hope it turns out! I think you truly found the pearls in the oyster! I love the grain after you worked on the legs and would never have guessed that’s how they would turn out. That’s my lack of experience showing and why we amateurs need your expertise. Gettin’ more exciting every day and I’m really looking forward to seeing both the finished vanity and the whole room! They are so beautiful! 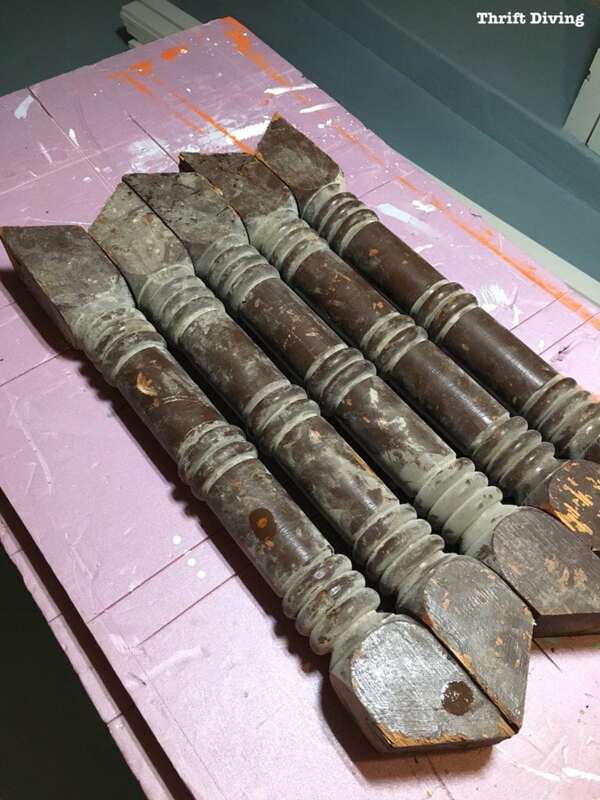 Stripping paint is such a pain, but such reward! I can’t wait to see the vanity! Thanks, Karen! I’ve now got the base attached to the legs! Today I shall make progress!! What a terrific find! And look at you go, Serena. I’m so excited to see where you go with this. The legs are an excellent start. Thanks, Alys! It’s going very well so far!! Today I will have to focus solely on the vanity! Yikes!! Can’t wait to see the finished project. I bet you’ll be finished in time! What time do I need to send you my “after” photos on Saturday? I’m pretty sure I won’t be going to bed Friday night, as i’m a bit (ahem) behind on my room!! I know you’ll be so happy when this job is complete, but hang in there! It’s going to be worth it all. Hi, Gail! I’m sure it will! I love pushing myself and seeing what I can accomplish! 🙂 I only hope I. Yikes something that’s sturdy and lasts! 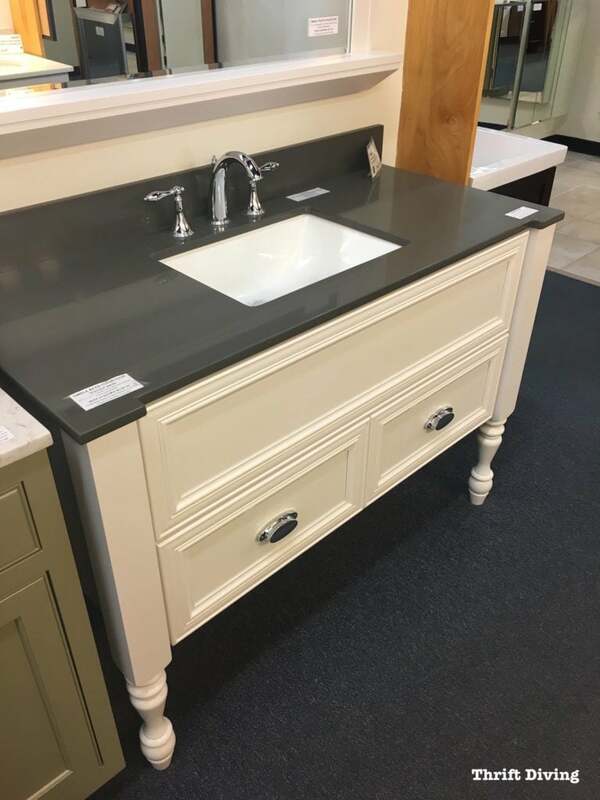 Otherwise hubby may never trust me, since he thought we should “save up” and spend $1,000 on a new vanity! Really battling my health right now – some serious things going on and also having to fight to get the medications I need. It really bites to live in a Rural Community when you are seriously ill. I have to see specialists that are three hours away and the tires blew on our van and well, the van is just too old to replace them and we cannot afford a new van. Then my cell phone was stolen and returned smashed to bits so I am now waiting for the new one to get here.